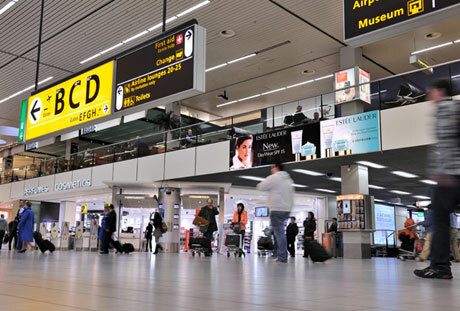 Amsterdam’s Schiphol Airport has installed an NFC boarding gate, supplied by air transport IT specialist Sita, allowing passengers to validate their boarding pass with a touch of their NFC smartphone. The installation is the first deployment of Tap n’ Fly, Sita’s proposed airline industry standard for NFC. Tap n’ Fly combines an applet that stores passenger information from any airline in a standard boarding pass format to ensure interoperability. It is customizable and backward-compatible with existing barcoded boarding passes. Passengers will be able to use their NFC boarding pass even if their phone is turned off or the battery is dead, Sita said. The gate works in conjunction with Sita’s AirportConnect Open passenger processing platform. This enables airports, airlines and their handling agents to access their respective IT applications in real-time on shared equipment. It also allows airlines to use any agent desk, gate position or self-service kiosk for passenger check-in, bag drop and boarding.